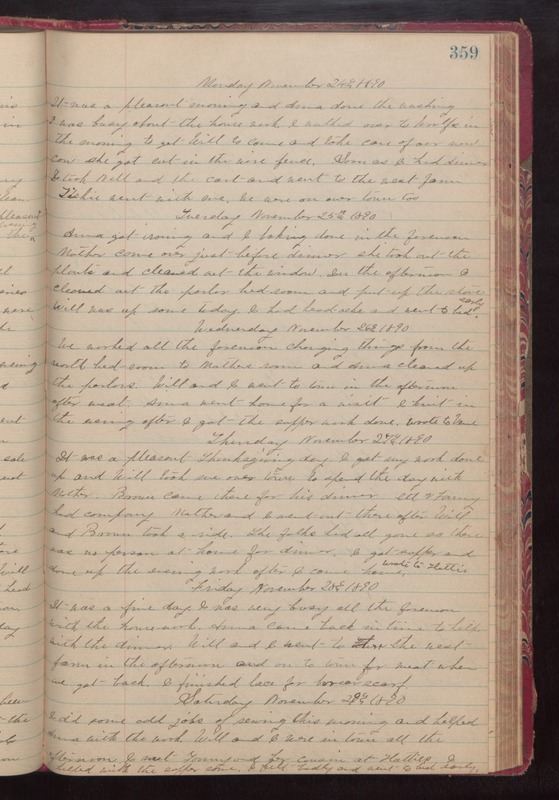 Monday November 24th 1890 It was a pleasant morning and Anna done the washing. I was busy about the house work. I walked over to Woolfs in the morning to get Will to come and take care of our new cow. she got cut in the wire fence. Soon as I had dinner I took Nell and the cart and went to the west farm. Tishie went with me. We were on over town too. Tuesday November 25th 1890 Anna got ironing and I baking in the forenoon. Mother came over just before dinner. she took out the plants and cleaned out the window. In the afternoon I cleaned out the parlor bed-room and put up the stove. Will was up some today. I had headache and went to bed early. Wednesday November 26th 1890 We worked all the forenoon changing things from the north bed-room to Mother's room and Anna cleaned up the parlors. Will and I went to town in the afternoon after meat. Anna went home for a visit done. I knit in the evening after I got the supper work done. Wrote to Vene. Thursday November 27th 1890 It was a pleasant Thanksgiving day. I got my work done up and Will took me over town to spend the day with Mother. Brown came there for his dinner. Ott & Fanny had company. Mother and I went there after Will and Brown took a ride. The folks had all gone so there was no person at home for dinner. I got supper and done up the evening work after I come home. wrote to Hattie. Friday November 28th 1890 It was a fine day. I was very busy all the forenoon with the house-work. Anna came back in time to help with the dinner. Will and I went to the west farm in the afternoon and on to town for meat when we got back. I finished lace for bureau scarf. Saturday November 29th 1890 I did some odd jobs of sewing this morning and helped Anna with the work. Will and I were in town all the afternoon. I met Fanny and her cousin at Hatties. I helped with the supper some. I felt badly and went to bed early.